1. 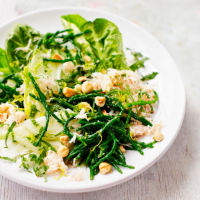 Cook the samphire in a pan of boiling water for 1 minute, drain and plunge into a bowl of cold water. Once cool, drain well and put into a large bowl. 2. Add the lemon zest and juice with the sliced fennel (and the fronds if it has any), mint and lettuce leaves. Toss everything together with the olive oil and plenty of seasoning, then lightly fold through ½ the crab meat. 3. Divide between plates and top with the remaining crab, the toasted hazelnuts and a splash more olive oil, if liked.